Mrs. Clara May Alexander, 80, of Barry, Illinois, passed away at 2:55 p.m. Sunday, July 8, 2018, at Hannibal Regional Hospital in Hannibal, Missouri. She was born January 27, 1938, in Atlas, Illinois, to Floyd Clarence & Sarah Deloris (Baughman) Baughman. They preceded her in death. She married Lawrence C. Alexander on January 27, 1958. He preceded her in death on June 10, 2017. She is survived by 1 son Larry J. Alexander, wife Linda R., of Byrnes Mill, MO; 1 daughter Linda M. Drion, husband Joseph Steven, of St. Louis, MO; 2 grandsons, Bill Adrian of Quincy, IL and Josh Drion of St. Louis, MO; 2 granddaughters, Michelle Wardlow of Macomb, IL and Elizabeth Drion of St. Louis, MO; 1 great grandson Seth Koontz, of Quincy, IL; and many nieces & nephews. In addition to her parents and her husband she was also preceded in death by a daughter Karen Sue Williams, a son-in-law Loren E. (Bud) Williams; 5 brothers, Melvin, Russell, William, Lonnie and Jim and 1 sister Bessie Stinson. Clara was a devoted member of the Barry Baptist Church and sang in the choir. 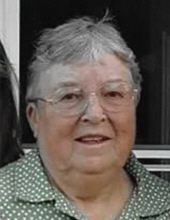 She enjoyed sewing, puzzles, nature and was an avid St. Louis Cardinals fan. Graveside services will be at 10:00 a.m. Thursday, July 12, 2018, at Park Lawn Cemetery in Barry. Memorials are suggested to the Barry Baptist Church. Kirgan Funeral Home in Barry is in charge of arrangements. To send flowers or a remembrance gift to the family of Clara May Alexander, please visit our Tribute Store. "Email Address" would like to share the life celebration of Clara May Alexander. Click on the "link" to go to share a favorite memory or leave a condolence message for the family.